'Put this function in new/existing MS-Access module.
' we will get an 'Object Invalid or No Longer Set' error. 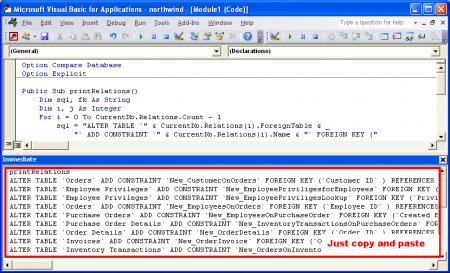 "` ADD CONSTRAINT `" & db.Relations(I).Name & "` FOREIGN KEY ("
sql = sql & "`" & db.Relations(I).Fields(J).ForeignName & "` ,"
fk = fk & "`" & db.Relations(I).Fields(J).Name & "` ,"
fk = fk & ")"
sql = sql & " ON UPDATE CASCADE"
sql = sql & " ON DELETE CASCADE"
sql = sql & ";"
To run the adobe code go to intermediate windows (Ctrl+G) and execute: printRelations and copy the generated SQL code. hi, great tool! i’m getting the following error, though: Compile error: Expected variable or procedure, not module. what am i doing wrong? am using msa2010. thanks much! woops, solved it by following http://support.microsoft.com/kb/312851 – just renamed the sub to something else. thanks much! you saved me money today, man! Great solution, thank you very much! First, I want to say that this is extremely useful! I found your code via StackOverflow. 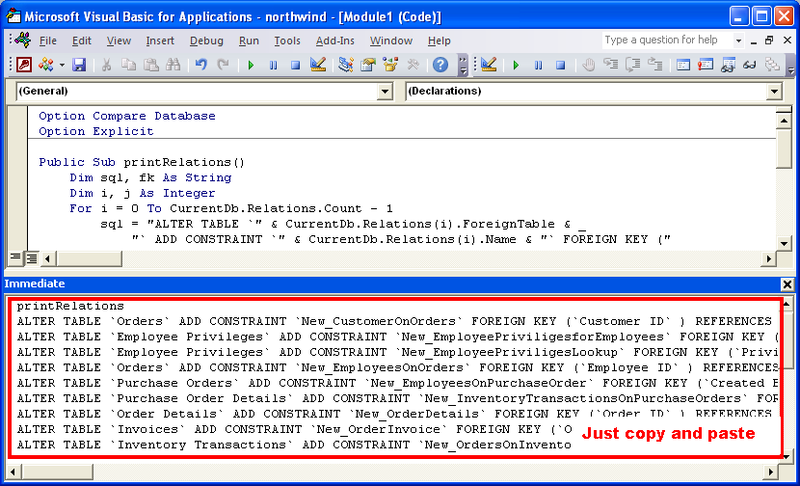 I am using the BullZip migration tool, which is great, except for the relationship/constraint creation. Need your help about this ‘ grab a reference to this once, otherwise when we retrieve a table below, ‘ we will get an ‘Object Invalid or No Longer Set’ error. In what conditions you get the error?